Vancouver, British Columbia - April 11, 2019 (Newsfile Corp.) (Investorideas.com Newswire) Revelo Resources Corp. (TSXV: RVL) ("Revelo" or the "Company") is pleased to announce that it has signed an Exploration Option Agreement with Sociedad Quimica Y Minera de Chile S.A., ("SQM") (NYSE: SQM), allowing SQM to acquire up to an 80% interest in two of Revelo's copper-focused projects at Calvario and Mirador in northern Chile. Both Calvario and Mirador display widespread geological characteristics indicative of the upper parts of possible porphyry copper systems, with Calvario having been the subject of minor historic drill testing, and Mirador representing an undrilled prospect. The two projects are contiguous and lie along one of the most prospective mineral belts in northern Chile, which includes major producing copper mines. 5-year option for SQM to explore and earn an 80% interest in the combined properties. Cash payments to Revelo totalling up to US$ 5.225 million distributed over 5 years. Exploration expenditures totalling up to US$ 13.0 million distributed over 5 years. If SQM completes the Option and earns 80% of the combined properties, a joint-venture company (JVC) will be formed with SQM owning 80% and Revelo owning 20%, but SQM will subsequently free-carry Revelo through to the completion of a Canadian NI-43-101 compliant Pre-Feasibility Study (PFS). Once the PFS is completed, Revelo will have 120 days to decide whether to continue as a partner in the JVC at a 20% level, with standard dilution clauses, or to convert its interest into a 1.0% net smelter return (NSR) royalty in exchange for delivering its 20% interest in the JVC to SQM. The JVC will be responsible for underlying royalties covering portions of both properties. The start date to the Exploration Option Agreement is subject to the successful conclusion of a surface rights access agreement with the single private owner of the surface rights at both Calvario and Mirador. Negotiations with the owner are at an advanced stage. The costs of such an access agreement will be met by SQM and included in the expenditure commitments indicated above. Tim Beale, CEO and President of Revelo, commented, "We are very pleased to have SQM, a major mining company with significant interests in Chile, as a partner at our Calvario and Mirador projects. This is Revelo's third currently active JV partner, with 4 projects currently subject to third party expenditures in northern Chile. We view both Calvario and Mirador as priority targets due to their overall geological characteristics, the widespread and intense nature of the hydrothermal alteration zones, and presence of important geochemical anomalies of interest. We are excited to see this exploration program develop." Both Calvario and Mirador lie along the southern extensions of the Paleocene magmatic belt of northern Chile that hosts some of the most important copper and precious metals deposits in the country, such as Cerro Colorado (BHP Billiton), Spence (BHP Billiton), Sierra Gorda (KGHM & Sumitomo), Nueva Unión's Relincho deposit (Teck-Goldcorp), El Peñon (Yamana Gold) and Guanaco (Austral Gold). Calvario encompasses about 6,900 Ha of 100% owned tenement, which is contiguous with the Mirador tenement directly to the south. Hydrothermal alteration extending over at least 5Km x 1Km, oriented northwest-southeast, is typified by extensive and intense quartz-sericite alteration, which typically occurs immediately above the potential copper-rich hypogene core of a porphyry copper system. Molybdenum geochemical anomalies in rock-chip sampling and quartz-veinlet stockworking support the prospective nature of the area, with copper oxides occurring associated with the principal target area. Minor, historic, shallow drilling has cut weak secondary copper enrichment, but no drill testing of a potential hypogene copper core has been carried out. The Calvario alteration zone is centred approximately 10Km north of the Mirador alteration zone. Mirador encompasses about 7,700 Ha of 100% owned tenement, which is contiguous with the Calvario tenement directly to the north. Hydrothermal alteration extending over at least 5Km x 1.5Km is oriented north-south, and possibly extends up to a further 2-3Km further south into an unexplored area. The alteration displays geological characteristics indicative of the upper portions of a porphyry copper and associated high-sulphidation base metals and precious metals system, with extensive quartz-alunite alteration at the highest elevations, transitioning into pyrophyllite and sericite at lower elevations. Multi-element geochemical anomalies in limited rock-chip sampling support the prospective nature of the area, with porphyry copper style quartz veinlet stockworking occurring at the lowest elevations in the north. The Mirador alteration zone is centred approximately 10Km south of the Calvario alteration zone. Calvario, located at altitudes of around 3,000 m to 3,300 m, is easily accessed via a paved road that extends from the Pan American Highway from the town of La Serena to the southwest, to Barrick's Pascua-Lama project in the high cordillera to the northeast, and which passes just 2Km to the north of the northern boundary of the Calvario property. A high-tension power line follows the same road. Existing dirt roads on the Calvario property make for easy access to all parts of the area of interest. Mirador, located at altitudes of around 2,500m to 2,900m, is accessed via a dirt road leading from the entry point to the Calvario property, and is located just 20Km south of the road and power infrastructure described for the Calvario property. 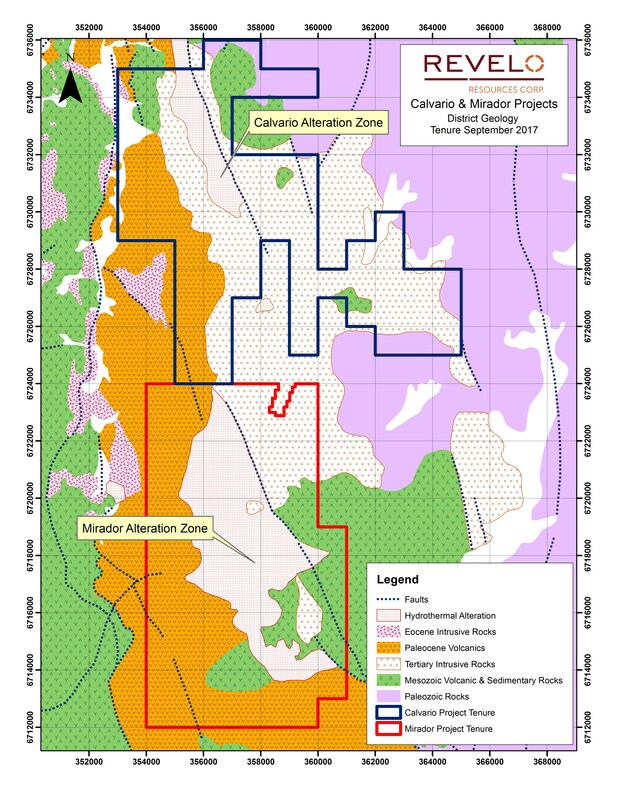 For further details of both the Calvario and Mirador Projects please refer to the relevant Project pages on Revelo's website (www.reveloresources.com). Dr. Demetrius Pohl, Ph.D., Certified Professional Geoscientist (CPG), an independent consultant, is the Company's Qualified Person for the purposes of National Instrument 43-101 Standards of Disclosures for Mineral Projects of the Canadian Securities Administrators and has approved the written disclosure of the technical information contained in this news release. Revelo has interests in an outstanding portfolio of projects prospective for copper, gold and silver located along proven mineral belts in one of the world's top mining jurisdictions - Chile. The Company has a combination of wholly-owned projects (available for option, JV or sale), option agreements, royalty interests (non-producing to date), and equity interests in mining and exploration companies. Revelo's total exposure to mineral tenements in northern Chile, either wholly-owned or through royalty interests, is around 200,000 hectares. This news release contains certain statements that may be deemed "forward-looking statements". All statements in this release, other than statements of historical fact, that address events or developments that Revelo expects to occur, are forward-looking statements. Forward-looking statements are statements that are not historical facts and are generally, but not always, identified by the words "expects", "plans", "anticipates", "believes", "intends", "estimates", "projects", "potential", "indicate" and similar expressions, or that events or conditions "will", "would", "may", "could" or "should" occur. Although Revelo believes the expectations expressed in such forward-looking statements are based on reasonable assumptions, such statements are not guarantees of future performance and actual results may differ materially from those in forward-looking statements. Disclaimer/Disclosure: Investorideas.com is a digital publisher of third party sourced news, articles and equity research as well as creates original content, including video, interviews and articles. Original content created by investorideas is protected by copyright laws other than syndication rights. Our site does not make recommendations for purchases or sale of stocks, services or products. Nothing on our sites should be construed as an offer or solicitation to buy or sell products or securities. All investing involves risk and possible losses. This site is currently compensated for news publication and distribution, social media and marketing, content creation and more. Disclosure is posted for each compensated news release, content published /created if required but otherwise the news was not compensated for and was published for the sole interest of our readers and followers. Contact management and IR of each company directly regarding specific questions.